JoAnne Elizabeth (Jacobs) Tevis, age 72 of Marion, left this earth to be with her Heavenly Father on Tuesday, December 6, 2011 after a long battle with cancer. She passed away at Lake Wales Medical Center surrounded by her loving family. JoAnne was born December 12, 1938 to the late Carl and Henrietta Mae (Hedges) Jacobs at their home near York Center. She attended school at York Center and through consolidation, spent her high school years at Byhalia. On December 31, 1954 she married Paul Eugene Tevis in the Richmond Methodist Church. They moved to the Richwood area and were blessed with five children, who all attended and graduated from the Richwood-North Union Public Schools. JoAnne is survived by one son, Paul Eugene (Molly) Tevis Jr., Steubenville; four daughters, Mary (Bruce) Robinson, Marion; Melissa (Robert) Werley, Vermilion; Debra (David) Clayton, Wadsworth; Pamela (Richard) Fussell, League City, Texas; nineteen grandchildren, fourteen great-grandchildren; three sisters, Janet (Larry) Dunn, Marysville; Jean (Richard) Plotner, Marion; Becky (Ron) Rynders, Abilene, Texas; three brothers, Charles (Lucille) Jacobs, Prospect; Jim (Donna) Jacobs, Little Hocking; Jerry (Linda) Jacobs, Garrettsville. Preceding her in death were her parents and three brothers. She was a member of the Crosswood United Methodist Church. JoAnne was very active in school activities during the years her children were attending school. She was president of the PTA, the Progressive Mothers Club and the North Union Music Boosters. She was a room mother for several years and chairperson of the Richwood Springenfest. 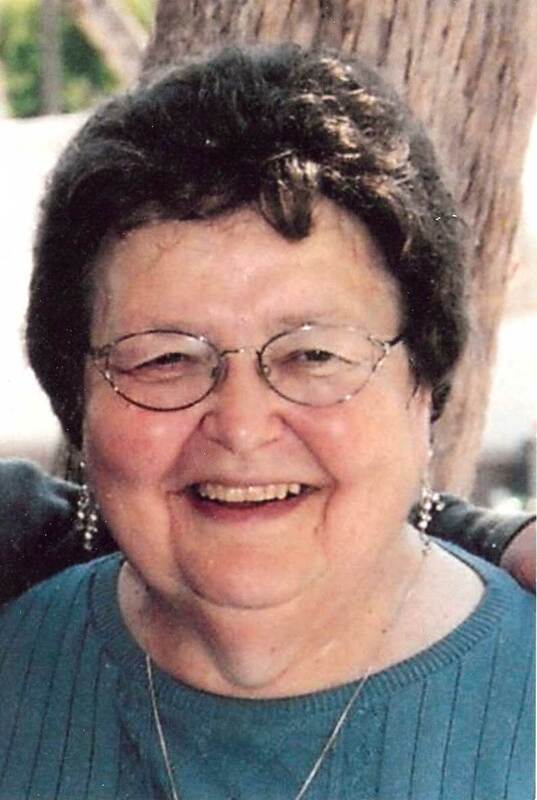 She was a 4-H leader for many years while her children were in school and served on the election board for many years in Union and Marion Counties. JoAnne and her husband were quite active in the Marion Hicks and Chicks Western Square Dance Club and the Swamp Fox Camping Club for a number of years. She was a member of Creators Gild in Marion Since 1989 where she served as president for one term. She worked for several years at the grocery stores in Richwood. She and her husband moved to the Prospect Area and she worked for LSY Advertising and retired from MPS Credit Union. She also had her own craft business for a number of years. After her husband, Paul (Gene) retired from Marion Power Shovel, they spent their winters in Lake Wales, Florida where they enjoyed several activities. JoAnne was in charge of the Sunday church services and played the piano. She was also chairperson of the Thursday Crafts. Funeral services will be Tuesday, December 13, 2011 at 1:30 PM in the Stofcheck-Ballinger Funeral Home, Richwood with Pastor Ryan Chivington officiating. Burial will follow in Prospect Cemetery. Friends may call on Sunday from 2 to 5 PM at the funeral home in Richwood. Memorial gifts may be made to Crosswood United Methodist Church, 1551 Richland Rd. Prayers are with you all, Glad the kids could be with you. My deepest sympathies during this very hard time. Its very hard losing a wife, mother, grandmother, great-grandmother but always remember all that she did for you and the love she had for each one of you and hopefully that will ease some of the pain. My thoughts and prayers are with all of you. Paul and family.So sorry for your loss.I know that she will truly be missed. I remember the good times we had when we worked at the grocery store. You will be in our prayers. My family (Willard Tevis (father)) and I want to express our deepest sympathy for your family. I believe JoAnne made an impression on everyone who knew her. She will be sadly missed. We will all truly miss her at the Tevis reunion. She will never be forgotten. Please accept my deepest sympathy in this time of sorrow. I have fond memories of JoAnne, especially when we were young. Her memory will live on in our hearts. May the comfort of friends and family be your strength now and in the days ahead. You're in my thoughts & prayers. Sorry to hear about JoAnne. We have thought about her often. Ohio family names always come up when Adams' are together around the kitchen table or on the deck. Everyone is kind of speechless to hear the sad news; but we all know breast cancer can be very devasting. JoAnne meant so much to us. When we were newly retired, we decided to check out florida. JoAnne and Gene made our life there so much fun and so interesting, we kept going back. We have the beautiful lighted christmas trees she tought me (and others) to make, and several other things. I will always think of her so fondly when we use them and always. Our sympathies to Gene and the rest of the family and everyone who knew and loved her. We just want to express our sincere sympathy to JoAnne's family. She was such a good-hearted, happy, energetic person. As a friend and classmate of Pam's, I enjoyed the times I spent at the Tevis' growing up! So sorry for your loss. To all of JoAnne's family. I never had the pleasure of meeting you, but JoAnne and I drove to work together for many years and LSY. She was a great friend and a great person. We had some good times. She will be missed. May the Lord wrap His loving arms around you and give you peace. Our sympathy goes out to all of you. I remember JoAnne with that hardy laugh and her willingness to take charge of the moment. She loved her kids and was always involved in their activities. Our thoughts are with you during this time. May God bless you and yours with His peace and comfort. You & your family are in our prayers & thoughts during this time. We also pray for safety for everyone who is travelling to & from. I am so very sorry about the loss of your mother. I know this is a terrible time for all of you. Please know prayers are being sent your way to help you through this loss. I am asking our Lord Jesus Christ to wrap his loving arms around you and protect you as much as possible. Thoughts and prayers go out to you, Melissa, and the rest of your family. Drive home safely and will be in touch. My deepest sympathy to you and your family, Pam, with the the loss of your mother. I am truely sorry to hear of the loss of your mother. My prayers are with you all. Our deepest sympathy to you and your families at this time. #29 Private Log in to view. We are so sorry to hear about JoAnne's passing. She always was a jovial person and had a wonderful smile. She reminds me so much of her mom, my former neighbor. You are all in our thoughts and prayers during this difficult time. May God give you strength. Gene and family, I was so sorry to hear about JoAnne. She was a wonderful person. I enjoyed all the times I spent with her and my Mom doing crafts at Getaway. She will be missed. Mom will be lost without her. My dad and I were very sorry to hear about the passing of JoAnne. She and Paul and my parents had a lot of fun evenings playing spinner after going up to Carlyles to eat. She and my mom are playing spinner together in heaven once again.